Mohamed Salah scored a late equaliser for Egypt away to Nigeria in their 2017 Africa Cup of Nations qualifier as an estimated 40,000 people watched in a 25,000-capacity stadium on Friday. 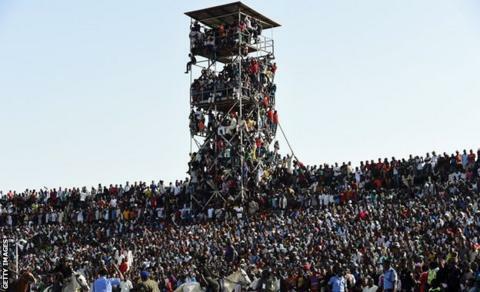 The Kaduna State government let fans in for free at the Ahmadu Bello Stadium, which led to severe overcrowding. The draw keeps the Pharaohs on top of Group G by two points from Nigeria. Nigeria took the lead on the hour through Warri Wolves' Etebo Oghenekaro before Roma winger Salah's equaliser. Some supporters climbed up floodlight scaffolding to watch the game, while others sat on the roof of neighbouring houses. No off-pitch incidents were reported. Only the top teams from each group are guaranteed progress to the next round in the race to reach Gabon, with the best two runners-up also qualifying. The biggest win in Friday's qualifiers came in the day's final match with Sofiane Feghouli and Islam Slimani bagging braces as Algeria crushed Ethiopia 7-1 in Blida. Algeria have a maximum nine points in Group J, Ethiopia four, Seychelles one and Lesotho none. Ivory Coast moved to the top of Group I thanks to a 1-0 win over Sudan. Gervinho, who captained the side in the absence of the injured Yaya Toure, scored the winner on 34 minutes. Gabon beat Sierra Leone in the group's other match. However, the points from that match do not count because Gabon are hosts of the 2017 tournament and their group games are classified as friendlies. Youssef Msakni struck the only goal of the game to give Tunisia a 1-0 home win over Togo. The decisive strike came two minutes after the interval and the result lifted Tunisia to the top of the Group A table, taking over from Togo on goal difference. In Group M, Mauritania beat The Gambia 2-1 thanks a to a brace by Cheikh Moulaye Khalil. Mustapha Carayol equalised for visitors The Gambia on the hour mark, cancelling out Khalil's 36th-minute opener. But Khalil grabbed his second in injury time to give Mauritania three points, which lifts them level with leaders Cameroon. Swaziland and Zimbabwe played out a 1-1 draw in Group L.
Hosts Swaziland raced into the lead after only two minutes, courtesy of a strike from Felix Badenhorst. Zimbabwe equalised when Swaziland's Ndokuito put through his own net one minute before half-time. The result means Swaziland remain top of the table from Zimbabwe. Both sides have five points but Swaziland have scored one more goal than their rivals. In the group's other game Guinea and Malawi played out a goalless draw, neither side able to make up any ground on the teams above them - they remain three points off the pace. In Bamako, Mali moved to the top of Group C after a 1-0 win over Equatorial Guinea. Molla Wague secured the three points for Mali with a goal in the 82nd minute.